Crostini is an Italian appetizer made out of small slices of grilled or toasted bread topped with an array of choices such as cheeses, meats, fruits, vegetables and herbs. 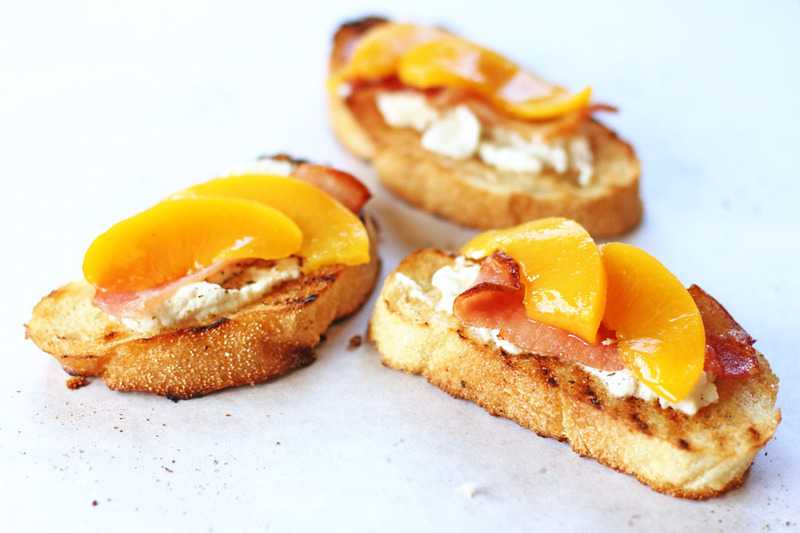 Today we will be making some ciabatta based crostini topped with ricotta, peach and bacon, an excellent combination of contrasting flavours which enhances every element on this humble grilled bread. Usually you can serve this as an appetizer or as a side with pasta. Fry or fan bake bacon until crispy, once cooked set it aside. Brush olive oil on ciabatta then grill in low heat. Spoon 1 tbsp ricotta in each ciabatta then sprinkle with freshly ground black pepper. Place bacon on top of ricotta. Place 2-3 slices of peaches on top. Sprinkle sea salt on top then serve. What a great combination of flavors. I can’t wait for fresh peaches to come in. 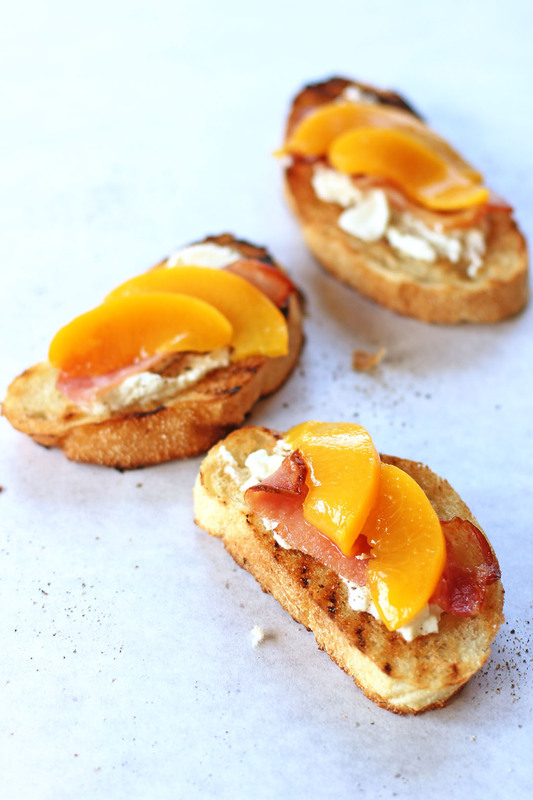 I love the combination of sweet in savory or vice-versa…looks great this crostinis…great for appetizers. I love the sweet and salty! Yum! Perfect combo of flavours. This recipe makes me miss summer. I bet this would be a great one to adapt to the BBQ to nibble on with a cider while your guests arrive and dinner is being cooked. Perfect slice of summer on a crostini! Yum! I LOVE these! This is the kind of thing I like to make for lunch, so it’s going into my lunch ideas! Love the sweetness of the peaches and the salt bacon. Fabulous! These sound like heaven! I’ve made something similar with basil in place of the bacon. Not quite the same, but still delicious. Peaches, black pepper, and ricotta belong together in more forms, I say! This would be a lovely contribution to this month’s Shine Supper Club. I hope you’ll join us! I get the peach with ricotta, but the bacon intrigues me! Will have to try this combination. I love the balance of salt and sweet.